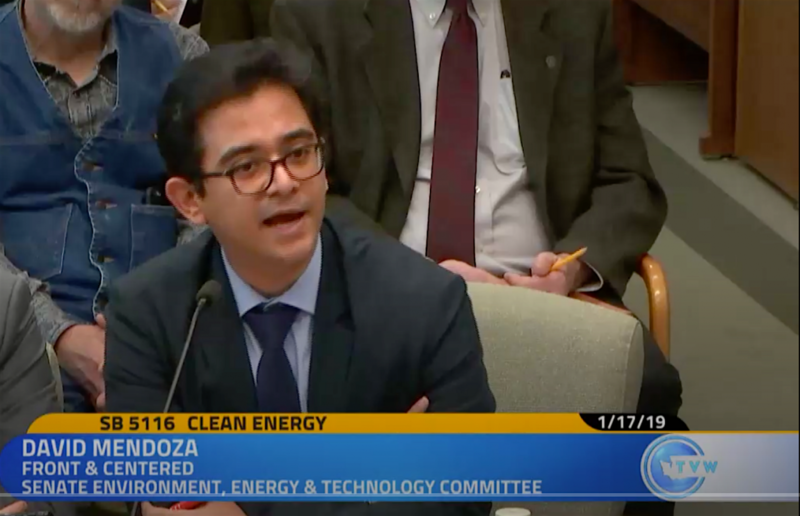 This week, Front and Centered testified in Olympia, adding amendments to the “100 percent clean” energy bills, Senate Bill (SB) 5116 and House Bill (HB) 1211. While we’re excited about the prospect of divesting from fossil fuels and coal completely, we want equity to be a major consideration in the transition to 100 percent clean energy by 2045. We’re advocating for clean energy justice and “universal energy assistance,” meaning energy assistance reaches all households that need it, and that clean power creates economic, environmental and health benefits for communities with the greatest barriers. David Mendoza, Front and Centered Legislative Director, advocates for two provisions to SB 5116 in his testimony from Thursday and from yesterday on HB 1211. “[Front and Centered is] a statewide coalition of communities of color and we represent over 60 organizations statewide. Our communities are on the frontline of climate change and bear the brunt of fossil fuel and industrial pollution where we live and work. “While we appreciate multiple aspects of this bill — especially the strong commitment to 80 percent reduction in direct emissions by 2030 and the phase out of coal — we do have concerns about this bill. As it’s currently drafted, it doesn’t address longstanding inequities present in the energy system. “To that end, we are advocating for two policies to be included in the proposed legislation. “First is universal energy assistance. Currently not all utilities in Washington provide energy assistance to low-income households, and those that do are only meeting a fraction of the need. Washington’s low-income households throughout the state have been and continue to pay disproportionate amounts of their limited income just to keep the lights on. This is true regardless of whether energy in this state is 50, 60 or 100 percent clean. We recommend that this bill as amended to require all electric utilities in Washington to provide energy assistance and that assistance reach 80 percent of households with lower incomes by 2030 and 100 percent by 2050. “In addition, as utilities begin to plan, acquire, and build new, clean power, we need to ensure that we maximize all the benefits of clean energy transition, and that those benefits reach everyone. To meet this concern, we support the requirement that utility investment plans must undergo an equity and public benefits analysis to inform investments.